The pro taped one up and I was off to the range. The first thing I noticed about “The Burnt Zebra” was how light it was. It felt like a Popsicle. 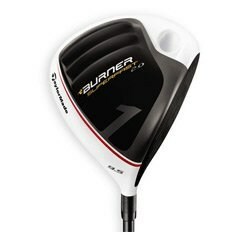 The 48 gram shaft is one of the key designs that is going to help me finally reach the back fence at my driving range. After loosening up I teed one up and took a crack at it. The ball shot straight up into the air. I swung the thing way to hard and caught the ball on the top of the clubface and popped it up. The ball may have very well traveled 300 yards, but most of that was straight up. On the next swing I swung super slow and the ball shot off of the chocolate face and flew about the distance that my old driver goes when I really go after it. Hence, I couldn’t wait to connect with one that I was really trying to pummel. In addition, the sloped crown and the low-riding sole move the center of gravity deep and low. This results in a high ball flight with little to no spin.